1. Heat the oil in a large pan and gently fry the onion for 3–4 minutes. 2. 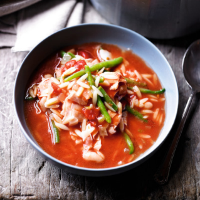 Blend the stock cube with 800ml boiling water and add to the pan with the tomatoes, cannellini beans, pasta and chicken.